America still loves the Conner family! The Roseanne reboot opened to massive ratings on Tuesday night: Per Nielsen, 18.2 million same-day viewers tuned in for the sitcom’s return, a bigger audience than it attracted with its original series finale back in the pre-DVR, pre-Netflix TV stone age of 1997 (16.6 million). Even more impressively, Roseanne redux didn’t just do well with older fans who remembered the show’s first run. Among ABC’s target audience of adults under 50, Tuesday’s hour-long premiere notched a 5.1 rating and was seen by one out of every five viewers in that demo watching TV at 8 p.m. last night. That puts it just below the 5.7 demo rating for last summer’s Game of Thrones season finale and on par with the same-day demo numbers for last fall’s season-eight premiere of The Walking Dead (5.0 rating), currently the No. 1 show on TV among adults under 50. In other words, Roseanne is shaping up to be the mother of all sitcom reboots. Among all viewers, of any age, the comparisons to other shows are remarkable. Roseanne demolished the same-day audience figures for the Walking Dead season opener (11.4 million), flew past the Thrones finale (12.1 million), and nearly doubled what NBC’s highly successful Will & Grace revival notched with its September premiere (10.2 million). There’s a good chance Roseanne’s already amazing performance will look even more spectacular later this week, once DVR and Hulu audience are tallied: If the show adds another 40 to 45 percent in the so-called L+3 ratings — as Will & Grace did with its premiere — ABC’s comedy could end up with almost as many viewers as this month’s Oscar broadcast (27.4 million viewers, including DVR replays). One note of caution: Reboots tend to fade as the notalgia factor wears off. Recent episodes of Will & Grace have brought in less than half the same-day demo audience as last September’s opener (though DVR replays still give the show good numbers overall). It’s quite possible these numbers will sink by the end of the show’s current run. 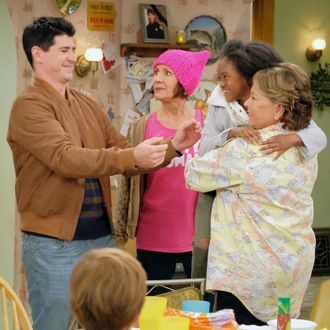 But even if half the audience who watched Tuesday flees, Roseanne will still be a major hit, and — assuming the cast is onboard — a season 11 is all but certain. Looks like Roseanne is going to Make ABC Great Again.